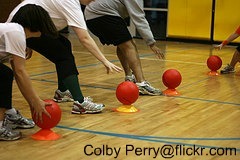 Dodgeball games are great if you're looking for fun activities for teenagers as well as younger kids. 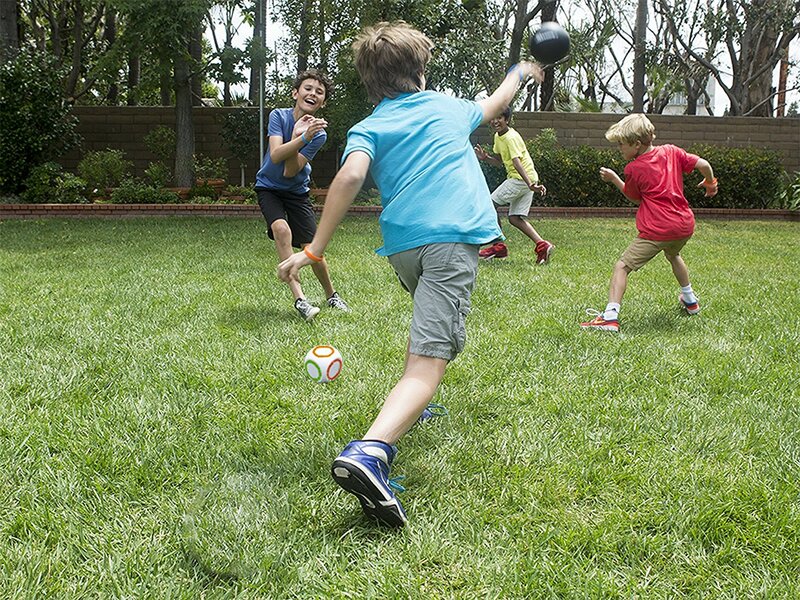 Of course, there's traditional dodgeball, a classic game that remains a favorite with kids everywhere. The official dodgeball rules vary among organizations and leagues, but the basic dodge ball rules used in tournaments and league play have been summarized below. If you're looking for other dodging games, you'll find variations of the traditional game along with other related games involving throwing and catching. Just follow the link at the bottom of the page. 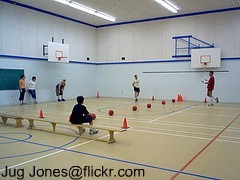 Dodgeball is played with 2 teams of 6 players if the game is played indoors and 10 players for outdoor competition. However, you can make the game as big or small as you want. Check out this king size game! The object of the game is to knock all of your opponents "out" of the game without being eliminated yourself. The game is played until all members of one team have been eliminated. The first team to knock out all of its opponents is the winner. The game is played for a pre-determined amount of time or until all members of one team are eliminated, whichever comes first. If there are players remaining when time expires, the team with the most players still on the court wins the game. A scored game can be played either as an elimination game or a timed game. Teams earn points for the number of players still "in" at the end of each game. 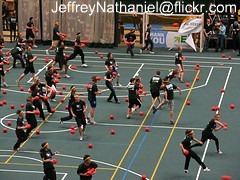 Dodge ball can be played indoors or outdoors. The ideal playing area is a rectangle identical to a volleyball court that's 60 ft long by 30 ft wide. The court is divided in half by a center line. An "attack line" is marked 10 ft from the center line on each side of the court. The attack lines are parallel to the center line and extend the full width of the court. There is also a 4 ft-wide "neutral zone" extending across the playing area at center court to separate both sides. A short hash mark is located at the very center of the court parallel to the sidelines. The mark is used to line up the balls to start the game. If you’re playing official dodge ball rules, you need 6 rubber-coated foam dodgeballs that are 8.25" in size. The first team to eliminate all opposing players is the winner. Each game has a 3-minute time limit. If neither team has been eliminated at the end of the 3 minutes, the team with the most players still in the game is the winner. A match consists of a predetermined odd number of games. Tournament matches are often played to the best of 7 or 9 games. The game begins with the "opening rush." 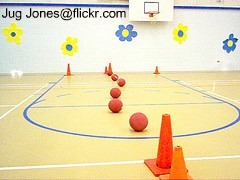 All 6 dodgeballs are lined up along the center line; 3 on one side of the center hash mark and 3 on the other side. Players position themselves behind their respective end lines. On the official's signal, both teams run to center court to get their balls. This signal officially starts the game. Teams may only get the 3 balls to their right of the center hash. There’s no limit to how many balls a player may retrieve. Players may not grab opponents and pull them across the neutral zone or prevent them from returning to their side of the court. A player may carry it across the attack line. A player may pass the ball to a teammate who is behind the attack line or who carries it across the attack line. A player rebounds the ball off of the back wall (if the court is enclosed). He gets hit by a ball below the shoulders – The ball may not hit the floor or wall first. She drops a ball that’s thrown to her. His ball is caught by another player. She steps out of bounds – During play, players may only leave the playing area to retrieve a ball, and they may only leave through their end line. They must also re-enter the game through their end line. He crosses over the neutral zone – Players may step safely into the neutral zone, but they may not step over the neutral zone line on the opponent’s side of the court. She slides or dives head first into the neutral zone. A ball hits him and another teammate (they are both out). She gets hit by a ball rebounding off of a ball lying on the court. He hits an opponent in the head with the ball. Blocking - Players can defend themselves by blocking a ball coming at them with another ball, but they have to maintain control of the ball they are blocking with. If they drop the ball, they are "out." Pinching – Players aren't allowed to squeeze the ball when throwing it to alter its flight. Each team is allowed one 30-second timeout per game. Substitutes may enter the game only during the timeout period, except in case of injury. To minimize stalling and keep the game moving, a violation is called if a team in the lead has all 6 of the balls on their side of the court for more than 5 seconds. The player or team will lose possession of all balls on their side. Retrievers are people designated to chase down balls that go out of play. Teams are responsible for providing their own retrievers, and the number of retrievers is usually determined by the tournament director. Players that are out of the game can also serve as retrievers. may not enter the court at any time. must wear different jerseys than the rest of their team. are only allowed to get balls from their side of the court. If any part of the player's body touches the end lines or far neutral zone line, the player is "out". If momentum carries a player out of bounds while making a catch, the player is not out as long as he had control of the ball before going out of bounds. An attacking player may legally cross the neutral zone to hit an opponent only if she is in the air and the ball leaves her hand before any part of her body touches the opponent’s territory. If she hits an opponent, the opponent is "out" and the attacking player remains "in." 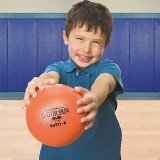 Because dodgeball games are so popular, there are all kinds of dodge ball rules and modified dodge ball games suitable for players of all ages and skill levels and groups of all sizes. 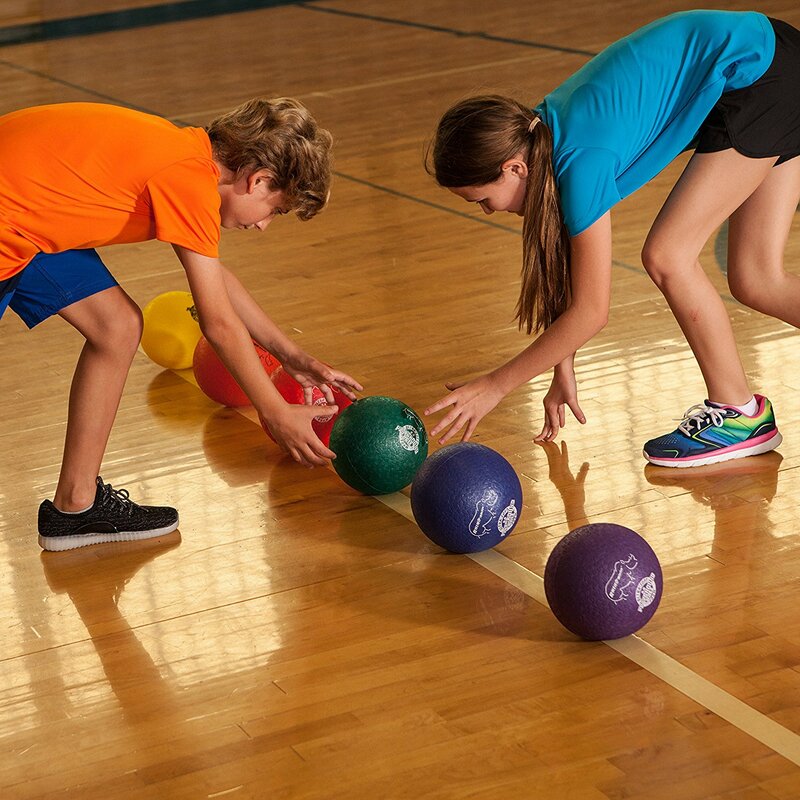 Here are some fun dodgeball games for you to try! Players roll a die to designate the Attacker who throws the ball. Everyone else scatters. The Attacker tries to hit every player with the ball to win the game. If a player catches the ball, the Attacker is out and everyone is back in the game. Perfect dodgeball game when you only have 2 people. 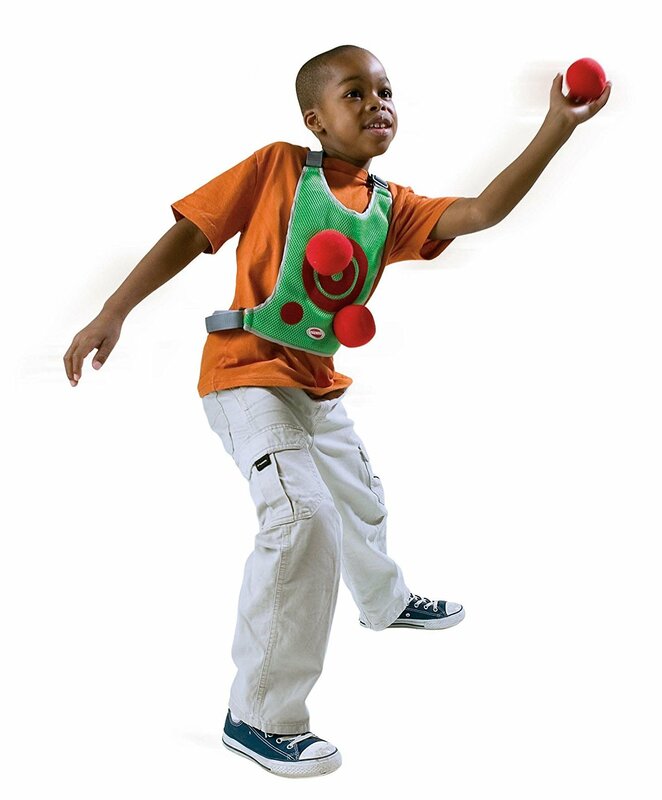 Players where a target vest and start with 3 soft balls. Players try to hit their opponent's target. If the all sticks, it's a hit. Did you know we have a United States Dodgeball Team? Follow Team USA as they compete around the globe! 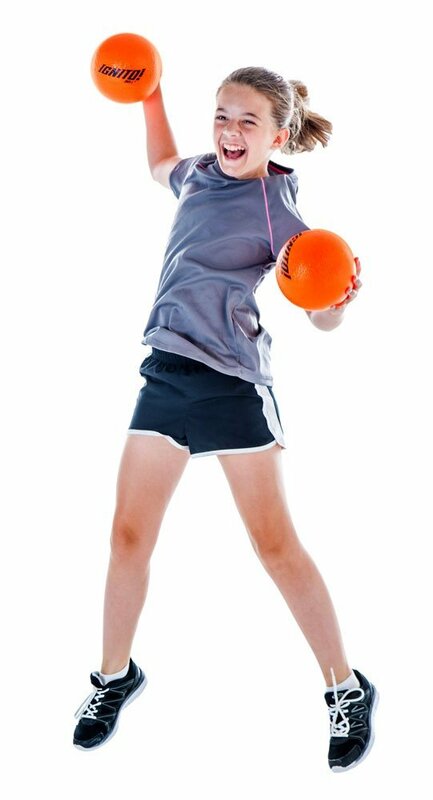 Find more fun dodgeball games and other sports activities!